Aluminium is the world’s most abundant metal. Its primary source, bauxite, is mined from reserves close to the earth’s surface, so habitat disturbance is temporary. Most electricity used to produce aluminium from bauxite is derived from renewable hydroelectric power. Low weight, high strength, corrosion resistance and formability are some of the key properties of aluminium. Aluminium is one third of the weight of steel yet when alloyed its strength to weight ratio is superior to that of steel. It has a natural oxide film that provides resistance to corrosion and which reforms itself if damaged. Aluminium is also a very good thermal and electrical conductor and, being non-magnetic and non-sparking, it has properties which make it of great value to many industries. It is naturally durable and can be cast, rolled and forged as well as extruded to be formed into an almost limitless range of shapes. Extruded sections are well defined with clean edges, corners and fine detailing. Joining is achieved by most methods including mechanical, welding and adhesive. Environmental concerns highlight further unique benefits of aluminium. It is non-toxic, safe to handle, causes no adverse run-off to groundwater, does not burn and is infinitely recyclable. The energy required to recycle aluminium is only 5% of that used in primary smelting. Aluminium is virtually maintenance free because of its strength and corrosion resistance. Its lack of electrostatic charge means that it does not attract dirt. A variety of professionally applied treatments, including mechanical and chemical pre-treatment prior to anodising or architectural powder coating, provide a very wide range of surface finishes which need little maintenance yet have great longevity. 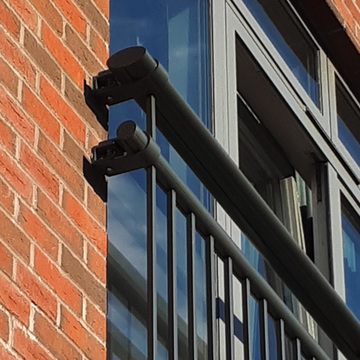 These benefits coupled with its low mass make aluminium the ideal choice of external and internal building components. The wrought alloy scheme, as adopted by the British Standards Institution, by CEN and by the other standards organisations globally, is as follows. Each registered alloy is described by a four digit number, with a further letter and number indicating the temper, or condition of the alloy. For example, 6082-T6 is a medium strength grade alloy based on the aluminium-magnesium-silicon family, in the fully heat-treated condition. Alloys fall into two main groups. The work-hardening alloys, such as the 3000 series, where strength is achieved by the amount of “cold work” applied to the alloy, e.g. by rolling, and the heat-treatable or precipitation-hardening alloys, such as the 6000 series, where the strength and properties are achieved by heat treatments of varying complexity. Contact Multi Metals for advice about aluminium alloy selection. Get in touch with Multi Metals for prices and delivery times for all your Juliet balcony requirements. 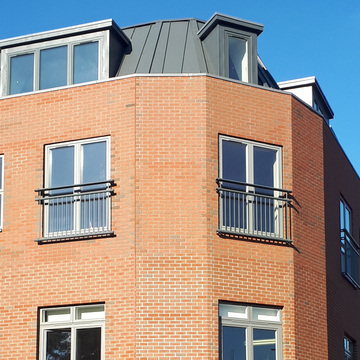 Find out more about the design and specification of our aluminium Juliet balconies.